The three fastest boats out-sailed the others in a rainstorm and three days later at 6 am, the British & African liner S.S. “Congo” picked up 50 passengers and crew who had been missed by the passing S.S. “Balmoral Castle”. 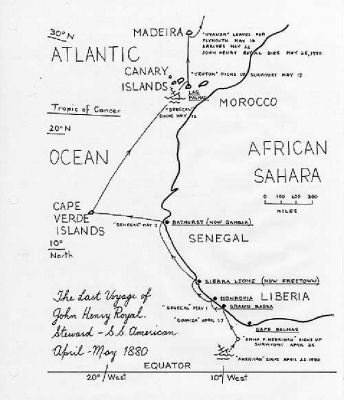 The “Congo” set course for Madeira after a fruitless search for other survivors. All the remaining boats had now become separated but on the moonlit night of Aprl 29th the lifeboat with Captain Wait and Chief Steward Royal aboard was picked up by the barque “Emma F. Herriman”, a five-masted sailboat of U.S. registry and trading in palm oil and hides. Later two more lifeboats were sighted and 65 weary survivors were crammed into the small evil smelling place on deck. Captain Upton of the Herriman sailed close to shore and sighted the SS Coanza which on May 7th took the exhausted souls to Grand Bassa in Liberia where after a dinner and dance with the Governor the ill-fated British & African Liner SS Senegal took them to Sierra Leone. On May 12th. en route to Las Palmas, Grand Canary, the Senegal hit a rock 12 miles out. 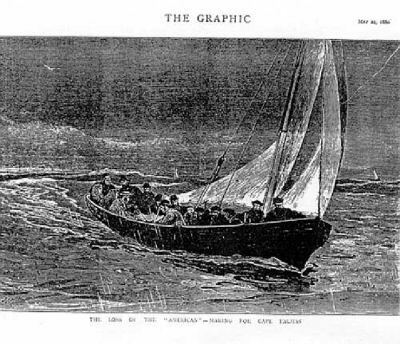 Captain Keene ordered full speed ahead to beach the ship before she sank but when the boats were lowered there was a general panic and rescued American passenger, the Honourable S. Paterson, Member of the South African Assembly was caught in the churning propeller and never seen again. The bedraggled passengers and sailors spent the night on the beach then took mules overland to Las Palmas where the SS Teuton transported them to Madeira for the SS Nyanza to take them on the final leg back home to Southampton. A later enquiry stated, “The Captain, officers and men deserve great credit for the way in which in their several stations they did everything they could to save the ship and the lives of the passengers”. The Union Line honoured Captain A. McLean Wait and in 1893 he became Marine Superintendent in Southampton after serving on six other Union ships. Following the amalgamation of the Union and Currie lines into Union-Castle he was assigned to run their New York office where he died in 1907 at the age of sixty.